Yesterday I spent about an hour browsing the melamine aisle at Target and it felt really amazing. Turning over the various floral pattern plate sets and palming the smooth plastic cups available in a variety of sea greens was just what I needed to come back to my domestic decision-making reality and refocus my attention after a blissful holiday week in Michigan. We didn’t do much recipe experimenting while on vacation, but we did roast marshmallows and grill the best veggie burgers I’ve ever eaten – thanks Michael, Stephanie, “Baby Lily”, and Kosar! I did, however, manage to try a wonderful new recipe for Quinoa with Roasted Summer Vegetables and Harissa Marinade from Amy Chaplin’s book “At Home in the Whole Foods Kitchen” before leaving town which I cannot recommend enough. The roasted vegetables and quinoa are the basis of many traditional Italian dishes, but the aromatic Harissa – a mild chile paste that’s a widely used staple in North African and Middle Eastern cooking – added an unexpected spicy flavor which will soon become a new staple in my kitchen. Pre heat oven to 375 degrees Fahrenheit. Cook quinoa two parts water to one part quinoa on medium heat for 20 minutes. Remove from heat and set aside to cool. Place zucchini, peppers and cherry tomatoes on a parchment lined cookie sheet. Drizzle with olive oil, sprinkle with sea salt and toss to combine. Put in oven and roast 20 to 25 minutes, stirring half way. Remove from oven and allow to cool. Heat a skillet over high heat add a tablespoon of olive oil and red onion and sauté for 3 to 5 minutes. Lower heat to medium and cook about 10 minutes or until onions are caramelized. Add a pinch of salt, stir and remove from heat. Set aside to cool. Warm a skillet over a medium flame and add the cumin, coriander and caraway seeds, toast for 3 minutes, shaking pan occasionally. Transfer into a spice grinder and grind until fine. 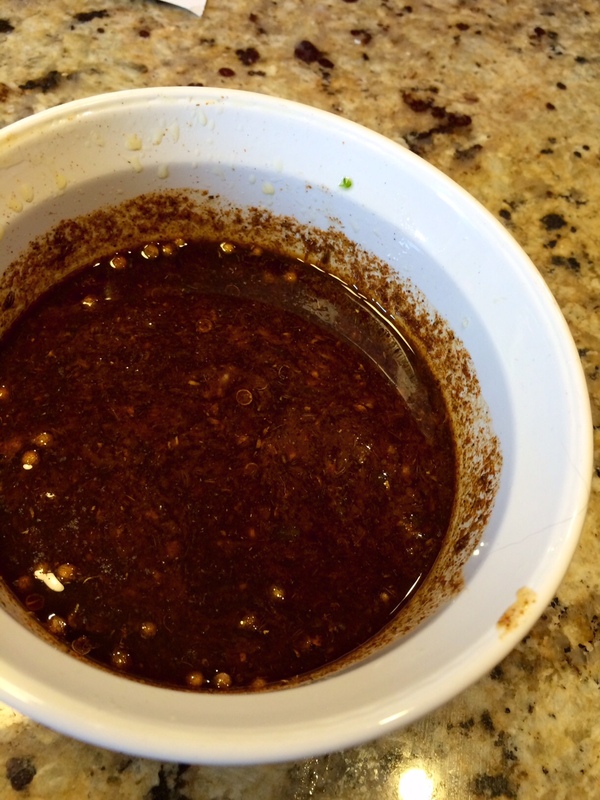 Place ground spices in a bowl and add the cayenne, garlic, lemon juice and salt. Stir and then drizzle in the olive oil, stir until smooth. Spoon harissa in a small bowl, add lemon juice and olive oil. I actually did about 1/4 cup olive oil to break down the paste a bit more. Stir well and set aside.Place cooked quinoa and roasted vegetables in bowl, drizzle with harissa, and gently toss to combine.